It’s worth the journey to West Texas for any Texan interested in visiting a part of the state that not only boasts desert and tumbleweeds, but also majestic mountains that lie just on the other side of the border and a real Texas night sky up close and personal. To make sure you are Texas-size pampered while on your jaunt the only choice is Lajitas Golf Resort and Spa. Lajitas sits on 27,000 acres located in a rugged desert environment and it is the perfect combination of outdoor activities like horseback riding and ATV tours mingled with a fair share of solitude and pampering at the resort’s spa. Overlooking the legendary Rio Grande, the resort sits between Big Bend National Park and Big Bend Ranch State Park and is just 30 minutes from Terlingua Ghost Town. The resort’s real draw is that it fits perfectly into the old west charm of the area and in addition to the more modern amenities like the Agave Spa, Black Jack’s Crossing golf course, zip lining in Quiet Canyon and the Candelilla Café there is also a real element of the cowboy lifestyle created here too. The Thirsty Goat Saloon in Lajitas serves a mean Prickly Pear Margarita and to really get into the Old West visit the Yates Longhorn Museum located at the Historic Trading Post building at Black Jack’s Crossing. You might also try your hand at Five Stand Sporting Clay Shoot or Cowboy Action Shooting in the fictional town created just for this activity, Stargazer Springs, where wannabe cowboys can walk through the town shooting a single-action pistol, side-by-side shot-gun or lever-action rifle just like the cowboys did years ago. Lajitas is more than just a resort, it is actually an unincorporated community that was put on the map in the 1970s when the folks living there elected the town’s first goat mayor. The beer-drinking Clay Henry was a Lajitas favorite and during his tenure he even appeared in several movies and drank a beer with Willie Nelson. These days Clay Moore Henry is the mayor of record, a direct descendent of the first Clay Henry and he and his wife both enjoy visitors daily. Most folks who stay at Lajitas Golf Resort and Spa will head into Terlingua Ghost Town, popular to many Texans because of the annual world-championship Terlingua Chili Cook-off, which began in 1967 and is held every year on the first Saturday in November. The old mining town is in perfect proximity for a day trip to Big Bend National Park just 12 miles down the road or you can opt for kayaking or horseback riding from one of the town’s outfitters. 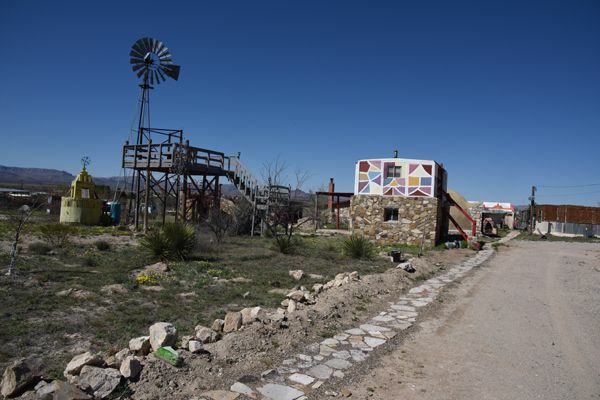 Terlingua’s limited, but colorful restaurants, bars and art galleries definitely create a local flavor and the Starlight Theatre Restaurant and Saloon is the gathering place every afternoon for locals and visitors who want to enjoy some authentic Tex Mex. On weekends there are live bands that perform at the Starlight Theatre and The Porch in the front of the Starlight is a fun place to meet locals who spend their afternoons spinning tales for visitors passing through. To get a good idea of the history of this once abandoned mining town, the ruins of the Chisos Mining Company is nearby. Right in town the Terlingua Cemetery offers a thorough glance at the area’s history, particularly during the Day of the Dead celebration held around the same time as the Chili Cook-off each year. Keep your eye on the goal once in West Texas though, because Big Bend National Park is right there and normally the final destination for most folks traveling to the area. You will enter the park at the National Park Headquarters, and from there you will have options from hiking, rafting, horseback riding, bicycling, camping or just overall exploring the countless back roads in your own vehicle. Big Bend gets its name from the bend in the Rio Grande and when exploring this part of Texas you will be amazed at the dramatic climate, scenery and wildlife – there are 450 different bird species in the park. Big Bend is right on the border of the United States and Mexico. One of the park’s most famous features is Santa Elena Canyon and it shares a location with both countries. It is time well spent in this part of Texas and likely offering some of the most Zen moments you are ever going to feel. Another town around the area to stop in at is the Gage Hotel in Marathon. I spent some time at the small spa there and it was worth every minute. You can also just hang out in front of your room in a rocking chair, or make yourself at home at the White Buffalo Bar where the margaritas come highly recommended. There is the historic hotel inside the building and more rooms in the back around the courtyard, where you can partake of those rocking chairs I mentioned. While many folks either drive to Lajitas and Terlingua as part of a road trip to Big Bend National Park you can also fly into Midland/Odessa Airport, which is about a four hour drive. There is also a flight into Lajitas International Airport from Dallas Love Field. Flights to Lajitas are on a Lajitas Charter Jet Service on most Friday’s leaving Dallas Love Field at 9:00 a.m. and arriving in Lajitas at 10:30 a.m. A return flight from Lajitas to Dallas Love Field is on Sunday leaving at 3:30 p.m. and arriving in Dallas at 5:00 p.m. At certain times of the year you can also fly directly into Lajitas from Houston Hobby and Midland/Odessa Airports.